Good health is about more than how many steps you’ve taken in a day or how fast you can run a mile. It’s important to keep a check on your stress levels. And getting a good night’s sleep is key, too – your body needs plenty of recovery time to prepare itself for the next day’s workout. Of course, there are plenty of tech devices out there that promise to help you achieve these goals. Here are seven such gadget that we here at Techlicious believe are worth your consideration. Meditation and yoga are terrific tools for reducing your stress levels and improving your concentration, but they can be tricky for a beginner to master. 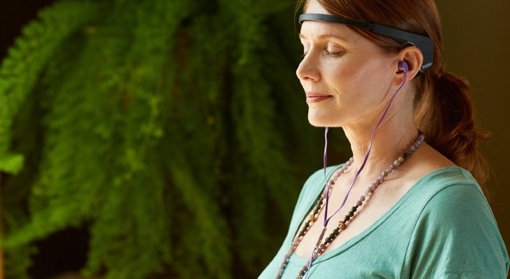 That’s where the new Muse headband comes in: It’s a headphone-sized piece of tech that fits around your head, measuring your brain’s electrical impulses to guide you toward nirvana. How exactly does Muse do it? When you connect headphones to a smartphone running the Muse Calm app, you’ll be able to hear just how focused your brain is. As your mind slowly ceases to wander, you’ll hear increasingly soothing sounds like ocean waves or a gentle breeze. Each Muse session can be completed in just 3 minutes, allowing you to fit the tech in to even the busiest of lifestyles. The Muse headband is currently available for purchase at chosemuse.com for $299. For more information, check out the brief promotional video below. Good sleep habits are a key foundation to good health, but for many of us, restful nights remain elusive. The new Nox Smart Sleep System aims to solve this problem by filling your bedroom with a peaceful combination of lights and sounds as you lay down to rest. The Nox Smart Sleep System consists of three components: A bedside light Nox light, a RestOn smart sensor that you slip under the top sheet of your bed and the Sleepace smartphone app. 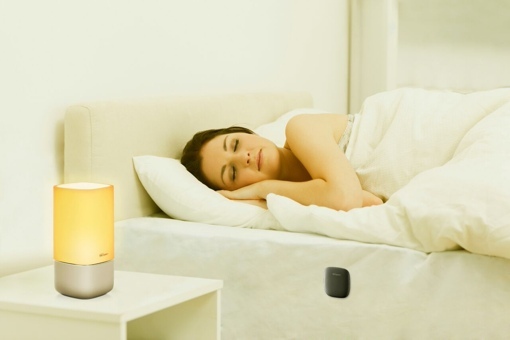 At night, the Nox emits light designed to stimulate your body’s production of the sleep chemical melatonin. In the morning, the Nox will use data collected by the in-bed sensor to wake you at the optimal time in your sleep cycle. And, of course, you can review all your sleep statistics on the app too in case you’re interested in sleep tracking. The Nox Smart Sleep System will launch in the U.S. later this fall for $279.97. You might also want to check out the competing Withings Aura – it offers similar sleep-improving functions. The Withings Aura is available now on Amazon for $299.95. Looking for a capable exercise monitor that’s loaded up with cool features? Check out the Microsoft Band tracker, the first fitness device from the software giant. It measures key data like heart rate, steps taken, calories burned and sleep quality, which it then tracks for you through its own smartphone app. Or, you can view your data right on the Microsoft Band’s handy LCD touchscreen. The Band also lets you reply to text messages, view incoming calls and even receive Facebook notifications right on your wrist. It even has a built-in UV monitor, so you'll know whether to apply sunscreen before heading outside. The Microsoft Band is currently available for purchase at the Microsoft Store for $199.99 and on Amazon.com at a slight discount. For more information, check out the short video below. There’s a reason why the crossfit health trend has caught on so fast – swinging kettlebells and flipping tires gets your body into great shape real quick. If you’re a crossfit enthusiast, you’ll definitely want to consider the new Jabra Sport Coach wireless coaching earbuds. They help keep track of your performance and maintain pacing during 40 popular crossfit exercises via an included smartphone app. The headphones talk you through your workout and have a dedicated app button so you can pause your workout or indicate you've finished a set without having to touch your phone. Jabra says an update is coming that will even count your reps for you. The headphones are sweat and water proof, fit securely in-ear and offer great Dolby quality music sound both inside the gym and out. You can find Jabra Sport Coach headphones in your choice of blue or green colors on Amazon.com for $199.99 each. You can learn more about the headphones by watching the short promotional video below. As its name suggests, the Withings Smart Body Analyzer scale does more than just measure your weight. The well-designed device calculates your heart rate and body fat too, providing a more accurate assessment of your health – after all, not all pounds are bad pounds. Measurements can be automatically sent to your smartphone (iOS, Android) where your progress and goals are tracked. I especially like the scale’s “athlete mode,” which intelligently adjusts the measurement process for bodies with a lot of muscle. And if that’s not enough, did I mention that the scale also keeps track of the weather forecast and your air quality, warning you when carbon dioxide levels are elevated? The Withings Smart Body Analyzer scale is available in both black and white on Amazon.com for $149.95. Nothing against fitness trackers, but in my experience, nothing keeps me on track at the gym quite like the right playlist. If tunes are a priority and you like to swim, you'll be interested in the Sony Walkman Bluetooth Sports Wearable MP3 player. The device stores up to 4GB of your favorite tunes, so you can swim or run for hours without needing to carry around your smartphone with you. You can also pair the device to your phone via Bluetooth to take hands-free calls while on the go. This Walkman is waterproof, relatively light (1.4 ounces) and includes a compact remote control. 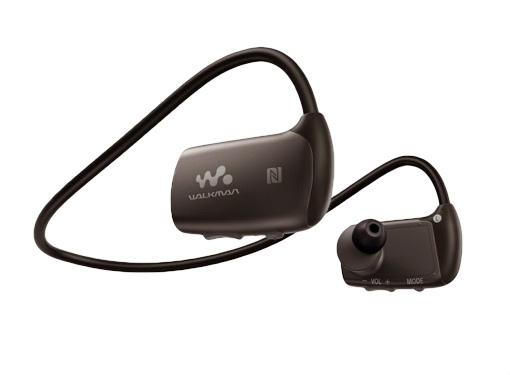 You can find the Sony Walkman 4GB Bluetooth Sports Wearable MP3 Player at Amazon.com for $158.00. The Lifespan Treadmill Desk is the natural evolution of the “standing desk” trend. It’s a work station that doubles as a fitness center – just place your laptop on the height-adjustable desk and use it while you walk. The treadmill itself can be adjusted between 0.4 and 4 miles per hour, and supports users up to 300 pounds. The included LED display shows steps taken, walking time, calories burned, distance traveled and belt speed. Because the TR1200-DT5 Lifespan Treadmill Desk is a piece of full-sized exercise equipment, it carries with it a full-sized price tag. You can find yours on Amazon.com for $1,498.99, a 25% discount off the MSRP. Nox Smart Sleep System is like Philips lamps and if it works the same way, this a really good deal. Here, in Europe, we don’t have Nox brand but the next time I go to NYC I’ll search for it for test purpose. Everything in this article is too expensive.